"Christmas Jumpers which rather than the ridicule you would expect at any other time of year, spark cheers, compliments and the much loved. Where did you get that?" Mark Everett - Creative Director and Co-founder. 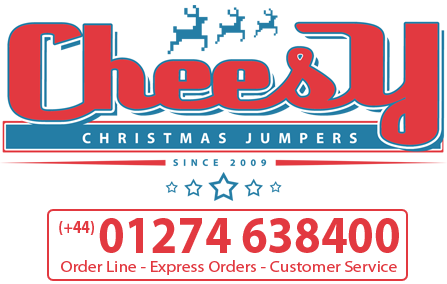 Cheesy Christmas Jumpers was formed in 2009 by father and son duo Paul and Mark Everett, in Bradford, West Yorkshire. With a passion for Christmas Jumpers and Cardigans we believe in designing and producing high quality garments which are unique to our brand. With a small tightly knitted team of three very creative individuals, we deal with the day to day running of the business, design, production, marketing, dispatch, customer service and growth of the Cheesy brand. The size of the operation does not however prevent our ambitious business from realising it’s potential, launching new collections year on year and demonstrating growth year on year with limited capital investment. We have become well known within the UK and Irish market for over the top, cheesy, ugly and some might say weird festive apparel. In fact our creative director (Mark Everett) has coined the phrase 'Christmas jumper which stretch the boundaries of what is normally publically acceptable to wear'. We produce garments that customers want to wear and others want to own!. Applying this ethos to each and everyone of our designs, we lead the way in Christmas jumper trends. The first major breakthrough for Cheesy Christmas Jumpers came in 2010 with the creation of the very first Cheesy light up jumper, the UK had never encountered a garment of this caliber before and the demand and attention this garment created made Cheesy the home of the famous light up Christmas Jumpers in the UK. All designs are exclusive to the 'Cheesy Christmas Jumpers' brand and are the brain child of co founder and creative director Mark Everett. Mark works all year round brainstorming and finalising the forthcoming festive season’s collection. He has a passion for Christmas jumpers, sweaters and festive garments. His true goal is to bring fun and festivities to households by offering quality cheesy, ugly and novelty Christmas jumpers, that can be worn by men and women. Year on year it's Mark's aim to design and produce the ULTIMATE Christmas jumper and taking inspiration from the latest fashion trends, adding a touch of Cheesy flare, a lot of hard work and using the latest technology, he hope this can be achieved. Every Christmas season we launch a brand new range of Christmas jumpers. Our line of independent Christmas jumpers make our garments more unique to your normal high street product. We have high quality standards on our knitted Christmas jumpers and only use the best quality materials and knit gauge to give a high standard finish. As a independent clothing brand our customers are our main priority. We aim to please each person with our quality garments and high levels of customer service. Our more premium product is unique to the Cheesy Christmas Jumper brand. The LED lighted Christmas jumper is designed in house but manufactured in China. This festive Christmas jumper features small LED lights embedded into the garment which with a flick of a switch create a jumper that flashes and lights up. The unique lighting system, is discreetly hidden and easy to activate whilst wearing. The Cheesy brand have reached the worldwide market including USA, Canada, Australia and Mainland Europe. We believe customers worldwide deserve the opportunity to own our wonderful Cheesy creations and it’s our goal to provide them with that opportunity. Since we started Cheesy Christmas Jumpers we have had a high level of demand for our Christmas Jumpers from many TV shows, celebrities and magazines. Visit our As Seen On TV page for further information. All images and designs - Copyright © 2019 Cheesy Christmas Jumpers. Please Obtain permission to use copyright material.